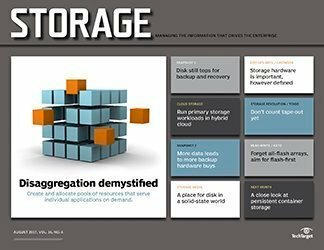 Explore the ways disaggregation concepts and principles are being applied to create and allocate pools of compute and storage resources to serve applications on demand. Organizations continue to demand scalable, easy-to-implement disk-based data backup storage devices over cloud or tape when increasing backup storage capacity. Learn what to look for in a hybrid cloud platform so you can take advantage of the scalability, agility and cost benefits it has to offer primary storage. HDD vs. SSD: Is there room for disk in a solid-state world? Although SSD vs. HDD speed is vastly different, for the foreseeable future, hard disks will have a place in our increasingly solid-state and even DRAM-centered data centers. Software-defined storage, positioned as the cure-all for vendor lock-in, suggests that hardware may not be as important to IT infrastructure as it once was. Tape data storage is very much alive as a means of seeding clouds with local data and as the main method for storing and archiving the tsunami of data facing all of us. Look for simple, cost-effective products that are optimized for flash and meet your needs rather than focusing on the all-flash array storage that vendors are pushing.